The cost of buying, equipping, and preparing to operate the two Boeing 747s that will become the next Air Force One presidential transport aircraft is now pegged at $5.3 billion, nearly one-third more than the figure routinely touted by the White House, according to Air Force officials and Pentagon budget documents. The projected price tag — included in the Pentagon’s fiscal 2020 budget proposal — marks the first time the Defense Department has provided a total cost estimate for the project. It includes not only the cost of the planes themselves, but also work to build a new hangar complex at Joint Base Andrews in Maryland and other administrative, engineering, and development work. “The total VC-25B acquisition cost...is $5.3B and encompasses all costs associated with fielding the system,” Air Force spokeswoman Ann Stefanek wrote in an email Monday, referring to the new Air Force One by its military designation. The Air Force has asked Congress for $758 million in 2020 to begin converting the two commercial 747 jetliners purchased in 2017 into a flying White House configuration. That work includes “management, detailed design, integration, modification, test/verification, certification, and product support to deliver two Presidential mission-ready…aircraft,” budget documents state. The physical work on the two jetliners is expected to begin in the fourth quarter of fiscal 2020, according to a project schedule. There’s also another $86 million request to start work on a new hangar complex at Joint Base Andrews, the two planes’ eventual home. 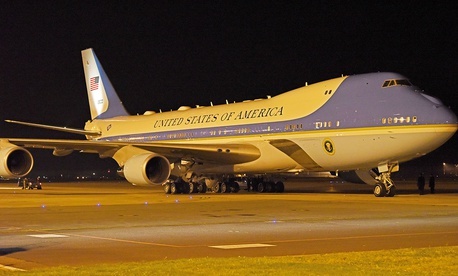 Air Force officials have always privately conceded that the program was going to cost more than the $3.9 billion figure touted by the White House last year, when the Air Force signed a deal with Boeing to convert two two 747s it purchased in 2017 into Air Force One configuration. Now the projected costs are out in the open.